Choosing the right surfboard is the key to getting the most out of this extreme sport because it can make the learning curve less steep—and less painful. You’ll find that they vary on several scores which can, in turn, affect how easy they’ll be to use. Surfing is a very physical activity that requires a strong core to keep you upright. A good beginner surfboard will help you by requiring less effort on your part. But before you head over to the surf shop, let’s go over some basics to help you navigate the waters knowledgeably and without sounding like a barney, i.e., surf speak for a newbie. It’ll improve your understanding of what you should look for to get the most out of your purchase. Let’s begin with the anatomy of a surfboard. You’ll learn that surfers have a lingo all their own even down to the nitty-gritty of the board. Some terms are obvious, others, not so much. The part that comes in contact with the water is called the bottom. Its purpose is to direct the flow of water along its length. Most often, it’s concave but not always. Some are more appropriate in various conditions. As a beginner surfer, you’ll do fine with the concave bottom which will work well in most situations. Once you get into the sport, you may end up with more than one surfboard, especially if you’re surfing different waters. The thing poking up at the rear of the board is the fin or fins. Its function isn’t unlike that of a sailboat, i.e., as a rudder to help you steer and to keep you from going sideways. Like the bottom, there are different shapes for better control and speed to match the surf conditions. You’ll find both removable and glassed-on versions. The fin has its own anatomy too. The bottom part is the base. Generally, the longer it is, the faster you can go. The length from the base to the topmost curve of the fin is the depth. The greater that it is, the more control you have. Finally, the angle from the end of the fin to the end of the base is the rake or sweep. The larger that it is, the more maneuverability you have with the board. Back in the old days, your foot would act as the rudder, hence, the term, hang ten. You may see boards with more than one fin. That’s moving more toward a performance board. Most beginner surfboards will have just one. Your board may also have a stringer along its length, especially if you have a foam surfboard. Its purpose is to provide added strength. Models made of other material may not have one. The part that you stand on is called the deck. You have a few options here. You can opt to use a surf wax on your board to improve your feet’s grip on the board. Sure, it’s some extra work, but it allows you to match the wax to the varying water temperatures. The number one thing to remember about wax is that you never apply it to the bottom of your surfboard. The alternative is a deck grip or traction pad. It’s a foam pad that you affix to the tail of the deck for a permanent solution. The advantage, of course, is that you can forgo the time waxing. Besides, you can get something fancy to customize your surfboard too. Usually, you’ll see just one pad where your back feet would go, but you may find two as well. The front end of the board that pokes out of the water is the nose. You’ll see them either rounded or pointed. The nose rocker or flip refers to its angle which can be either relaxed or steep, i.e., heavy. A higher flip is a good thing for a beginner because it’ll help prevent you from pearling. That’s when the nose of the surfboard goes underwater, and you go over the falls. The advantage of the round nose is that it gives you stability, a crucial factor for a beginner. That will, in turn, help build your confidence. A pointed nose or thruster, on the other hand, is a good option for taking on steeper waves. The rounded point nose is in between the two. Remember, surface area matters. When you go with anything other than a round one, you’re subtracting from the maneuverability of the board despite how cool it looks. The rails are the sides that you hang on to when you’re paddling out to catch a wave. You’ll find both soft and hard versions. The former are easier to grip, but the latter give you better maneuverability for turning your board around to point you back toward the shore. You’ll also see different variations of the shape too. The important thing is comfort. Pay attention to the thickness because that can affect how easily you can grip them. The tail is the end of the board. The most common is what is called the squash tail. It narrows toward the back with rounded points. It’s suitable for most conditions and is very responsive when you need to make those turns. Other shapes will provide better control in certain situations. The swallow tail, for example, is an excellent option for smaller waves because of the control it gives you. The tail will also have a rocker or kick. The larger it is, the greater maneuverability you’ll have on the water and making turns. It’s one of those specs you can tweak to get the ride that you want. You might opt to get a customized board with a tail that will suit the type of surfing you do down the road. There are several types of boards each suited for different types of surfing and water conditions. The one you probably think of first is the traditional longboard. You’ll find models anywhere from 9 to 12 feet long. It’s an excellent choice for a starter surfboard because it’ll give you the stability and maneuverability you’ll need as a beginner. It’ll work in most conditions that you’ll like encounter. Fish: The fish surfboard is less than 6 feet in length and wider than the typical board. It gets its name from the notched tail which resembles a fish. The design gives the surfer better speed and control, especially in steep waves. Hybrid: The hybrid surfboard is a blend of the features of a fish board with a shortboard at between 6 and 8.5 feet. Funboard: The funboard is like a hybrid only it has the characteristics of both a longboard and shortboard but wider and shorter at 7 to 8 feet. Gun: The gun or big wave surfboard is true to its name as the board of choice for these conditions with superior speed and maneuverability. They range from 7 to 12 feet and sometimes more. Size is an essential consideration when buying your first board. Generally, the wider the board, the more stable you’ll be on it. That makes sense since you have the greater surface area to stand. However, it can affect your ability to maneuver as well as your speed. Pay attention to where that widest point of the board lies. You’ll have the best maneuverability with a surfboard that has its wide point below the center. Bear mind that choosing a board involves some give and take. A wider surfboard may feel more stable to you, but it may come at the price of some control and speed. It’s a matter of striking the right balance. Take into account your body weight too. The heavier you are, the greater surface area you’ll need to stay upright comfortably. 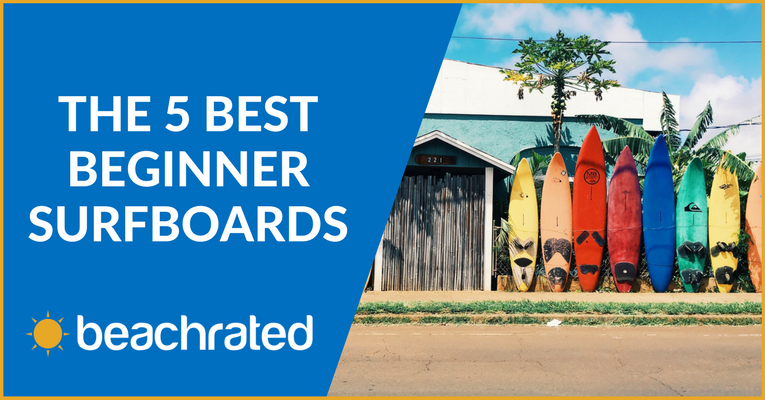 Along with the longboard, other choices for the best surfboards for beginners include a funboard or hybrid if you’re on the smaller size. Most of the boards you see today are made of either polystyrene or polyurethane foam which are strengthened with the use of one or more stringers. These surfboards combine the lighter weight with the buoyancy to make them easy to use. Fiberglass cloth and resin cover the inner core to make them waterproof and add additional strength to the final product. This quality is essential because a leak will add to the board’s weight and make it more difficult to handle. That’s part of the reason why the foam boards are so popular. The outer layers placed over the core ensure that it’s 100-percent waterproof. You may see hollow wooden surfboards or some made of more other materials like carbon fiber composites. There are also boards that are a combination of wood and foam. Bear in mind that some of these models are considerably heavier than the foam ones. That’ll make a big difference when you’re hauling it back and forth to your car and the shore. Now that you’ve got the intel, it’s time to get down to choosing the best beginner surfboard. The things we looked for were the features that a beginner would appreciate most such as a comfortable ride with adequate surface area to make it feel stable. We also paid attention to the weight, staying on the lighter side to make it easier to handle. Here’s our roundup of the best beginner surfboards. The Empire Ehukai Soft Surfboard has a high-density EPS Core for great buoyancy. EPS or expanded polystyrene foam is both lightweight and rigid for added strength. Because it’s a closed-cell construction, it does an excellent job of waterproofing. It will resist bacteria formation and decay, making this board a sound investment. It has four stringers to add the necessary reinforcement for a foam board. It has a rounded nose and a squash tail end. The board comes with a surf leash which is a nice add-on feature. You are planning on using one every time you go out, right? The surfboard is a comfortable 7 feet in length. It has a tri-fin setup for greater versatility and strength. The Empire Ehukai Soft Surfboard is a great overall design with plenty of space to move around on the deck. The combination of stringers and EPS foam is a great matchup for a board that can take the punishment of the waves. It is lightweight, making it easier to handle for individuals new to the sport. Make sure and double check the fastness of the fins before heading out. While the tri-fin setup offers a lot, it does increase the drag which may frustrate beginning surfers. The body of the board can take a hit if you go over rough rocks. The Empire Ehukai Soft Surfboard is an excellent choice for the beginner who wants a board that can handle a variety of conditions and is just testing the waters of surfing. The Gold Coast Surfboards – 8’8 Soft Top Foam Surfboard is different riff on the longboard with a wider profile for added stability. It has a concave bottom with a round nose and squash tail end. It is made of EPS foam with two wooden stringers and a ⅔ length center fiberglass rod. Like our previous selection, it has set of three screw-in fins. That’s a nice feature for the beginner who wants to experiment with different setups. The board comes with a leash which is always a plus. It will accommodate surfers up to 270 pounds. There’s a lot of attention to detail with the beginner in mind with this surfboard. That’s evident in the nose flip and tail kick. The Gold Coast Surfboards – 8’8 Soft Top Foam Surfboard comes with a rubber bumper on the tail which is a smart addition for an individual just learning how to surf. The board has a Croc-Skin Textured IXPE Foam Deck, so no waxing needed. Yea! The use of the fiberglass rod cuts some of the added weight while providing outstanding strength to the board. Smaller surfers may find it a bit unwieldy to handle. Beginning surfers will need to pay attention to the fin setup and make sure it’s attached properly. The Gold Coast Surfboards – 8’8 Soft Top Foam Surfboard is a well-made board that definitely has the beginning surfer in mind. The Raystreak 7’2″ Crocodile Groove Soft Surfboard is made of EPS foam for superior waterproofing. It has a fiberglass coating on the top to protect the surface of the board. The 22-inch wide deck has a hot-pressed IXPE skin with a crocodile groove surface for good traction and grip. The board is strengthened with two reinforced epoxy sealed poplar stringers. The Raystreak also has a three-fin, removable setup for added versatility. We liked the soft top which is a smart feature in a beginner board to reduce injuries. It is well-made and includes a surf leash. The Raystreak 7’2″ Crocodile Groove Soft Surfboard has both nose and tail bumpers to protect it in rough waters and during transport. The board comes with a 100-percent satisfaction guarantee. The surfboard is thicker than other comparable ones, making it more buoyant. We’d prefer a longer leash than the 7-foot one that is included. The surfboard may blister if it’s left in the sun when not in use. The Raystreak 7’2″ Crocodile Groove Soft Surfboard is a good value with a board that is durable yet lightweight. The Liquid Shredder 70 FSE EPS/PE Soft Surfboard is billed as an economy, novice surfboard. That said, it has a lot to offer the beginning surfer. It has an EPS foam core and an expanded polypropylene (EPE) deck for comfort and traction. There’s no need to wax this board. Just follow the manufacturer’s recommendations on care. It strikes a nice balance between strength and comfort that we enjoyed. The surfboard is thicker, which we love in a board for the cushy ride. Don’t let the softness of the board fool you. It can handle the punishment like a champ. The Liquid Shredder 70 FSE EPS/PE Soft Surfboard comes with a 90-day, non-commercial use warranty. The surface of the board is durable and does a great job of resisting dings and scratches. The board is light enough so that all users shouldn’t have a problem handling it. The board doesn’t come with a leash which seems odd given its marketing to beginners. You’ll need to pay attention to make sure the fins are properly before heading out to the surf. The Liquid Shredder 70 FSE EPS/PE Soft Surfboard is a good quality board that is well-constructed and built for comfort. The Gold Coast Surfboards – 6’8 Hybrid Soft Top Surfboard is the only hybrid among the bunch. It is the kind of board for someone who wants to jump into the deep end of the pool. It has performance features that will help you transcend from beginner to a more experienced user. Unlike the other boards, it has a pointed or thruster nose and a rounded profile. Besides that, it looks great. Despite its smaller size, its width is comparable to the other models we considered at just one inch less. It has a swallow tail with FCSII fin boxes though you’ll have to buy your own fins. It has a textured soft-top deck that requires no waxing though you can apply it if you need the extra grip. It has an EPS foam core to keep the weight in check with I-beam stringers and bamboo layer reinforcements. The Gold Coast Surfboards – 6’8 Hybrid Soft Top Surfboard includes a GoPro mount so that you can capture the fun of catching the waves to share with your friends. It can accommodate users up to 210 pounds, as per the manufacturer. The board tips the scales at only 7 pounds. The board does not include the fins or a leash unless you upgrade to the package which is certainly a dealbreaker for some. The Gold Coast Surfboards – 6’8 Hybrid Soft Top Surfboard is a good-looking board for the surfer that wants to have some fun catching the waves. After reviewing the specs and features of the choices, the Gold Coast Surfboards – 8’8 Soft Top Foam Surfboard won out as our favorite of the group. We liked its larger surface area which we felt was important for the newbie. In fact, we would call it one of the best longboard for beginners simply because of the little things that the manufacturer put into this design. From the user-friendly rockers to the bumper to cushy foam deck, the board ticked off all the boxes for what we’d want to get started riding the waves. We also liked the addition of the fiberglass stringer which added strength without weighing the surfboard down unduly. It’s a board that will carry you through from beginner to advanced user with its great maneuverability and stability. These qualities are important for the beginner surfer to ease them through the early learning process regardless of their fitness level.